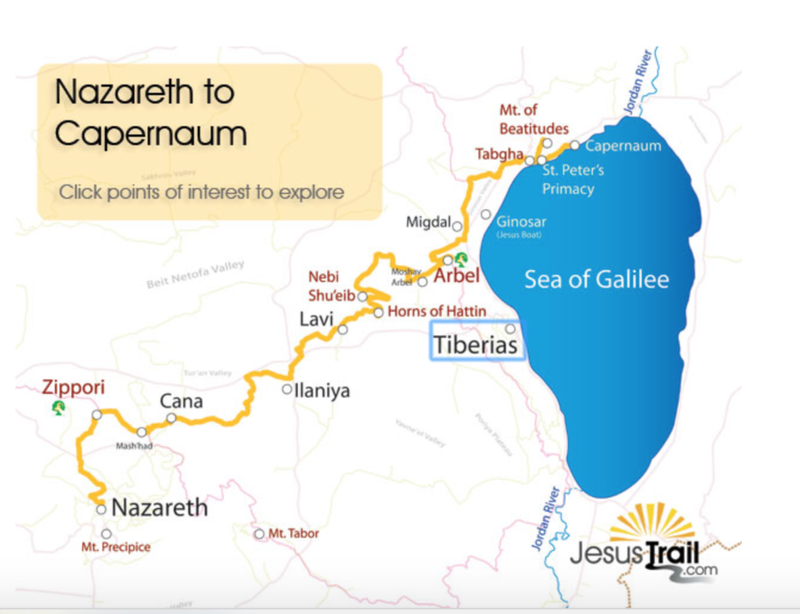 It’s not often that I see a combination of two of my favorite beats: Religion and travel, but a recent story in the Wall Street Journal travel section told of the quickly becoming-famous “Jesus trail” through Galilee that could theoretically be walked in three days. Tara Burton, the newish religion corresponded for Vox.com, wrote the Journal piece about how she found the 40-mile trail through rural parts of Israel to be welcoming and full of multi-cultural and multi-religious experience. But the comments to the article brought out some other angles: How only in Israel might a Western woman expect to hike unmolested. If Burton tried this in certain others Middle Eastern countries, her experience might have been very different. First, the article, which, being behind a paywall, will be reproduced here as much as I’m able to cut and paste. It took five minutes into my pilgrimage for somebody to offer me free food. Leaving my inn, a converted 19th-century mansion in the Israeli town of Nazareth, I’d turned the corner to make the initial ascent toward the Franciscan Mensa Church. The church stands on the site where Christ was said to have dined with his apostles just after his resurrection. A smiling man with a lazy eye, standing by the trail head, decided I should dine, too. 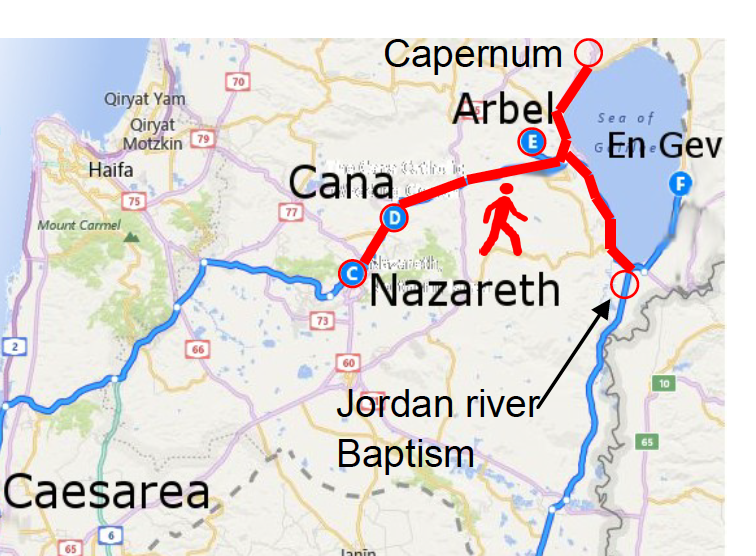 I spent nearly as much time eating with strangers as walking during my trip earlier this year along the Jesus Trail, a 40-mile trek connecting several major sites of Jesus’ life, from Nazareth to the Sea of Galilee (also called Lake Tiberias). But that was, according to the Jesus Trail’s founders, the point. I would have liked to see a more pointed reference to the original point of the trail, which is explained here. That is, the idea was to send people along the trails that Jesus walked and to experience the land as he did. Ecology, hospitality and ecumenism are worthy effects, but not the most important point. I did some hiking around Israel in 1989 and, as it happens, one of my hikes near Mt. Arbel overlooking the Sea of Galilee was in the same area as this path. The whole idea of such expeditions was also to get people away from the typical packaged Israel tour and into the highways and byways where they can meet actual people. It’s perfect for experience-seeking millennials and others of us who hate viewing the Holy Land via tour bus. This alternative trail, intended to entice curious hikers as much as pilgrims, links religiously disparate areas -- Muslim and Christian towns such as Nazareth and Cana, the Orthodox Jewish kibbutz of Lavi and the Druse temple at Nabi Shue’ib. The trail’s founders hoped it would encourage travelers to spend their money on local businesses, rather than large-scale hotels and packaged tours. The author recounts the amazing hospitality she met at the hands of Muslim, Christian and Jew alike; how she accepted a ride from a Muslim construction worker who took pity on her getting lost somewhere near Nazareth (apparently the trail markers are a bit sloppy in places) and how she managed to merge Orthodox and Catholic at a Cana guesthouse. I found it an easy and entertaining read although doing a nearly 40-mile hike (apparently she didn't quite get to the end point in Capernaum) in three-to-five days is traveling at a pretty good clip. Some of the comments raised interesting questions. What if the trip had been through Palestinian areas? Would her welcome have been the same? How did a Muslim man give a ride to a single woman unrelated to him? Normally, that’s verboten. And would the locals have been as welcoming to what one commenter called “a dumpy white guy in his 60s” as they were to a younger and more attractive female reporter? The one change I would have made would have been some caveats. A friend of mine has hiked the trail and she says it's harder than it looks. Some of the reviews on Trip Advisor say there's a ton of trash outside the Arab villages; that it's very easy to get lost and not a good idea to do it during the hotter months (ie between April and September) and one of the single female hikers said she was definitely leered at by the men and recommends one travel in a group. Israel isn’t the only place getting into such experience-oriented tourism. Jordan has opened up the 400-mile Jordan Trail, which you can hike in parts, as doing the whole thing takes about 40 days if you do 10 miles a day. The selling points are the scenery and the people. This sort of intense hospitality characterized the rest of my journey, too. That night, I stayed at a guesthouse in Cana, where Jesus is said to have turned water to wine, and where Orthodox and Catholic churches commemorating the miracle echo each morning with rival choral music. Sami Bellan, the puckish owner of the guesthouse, crowded with porcelain Virgin Mary figurines, decided to “anoint” me in the Galilean fashion with local olive oil, rubbing it into my forearms and the back of my neck before bringing me a plate of biscuits. When, a day or two later, it started to rain near Migdal—once Magdala, hometown of Mary Magdalene—I sought shelter in a children’s horse rental stable; the proprietor refused to take any money for the cardamom-thick coffee I consumed. Again, I’m not sure whether a larger group would have gotten quite the same treatment, but it’s heartening to read of how hospitality trumps religious differences. I do some travel writing and believe me, molding religion with travel is a tough sell and few outlets will buy it. Burton has done other pieces for the Journal, which may have paved the way for this piece, but all the same, I'm glad they managed, among articles about art tours of the American South and London's best pubs, to fit in a place where interfaith has real meaning.